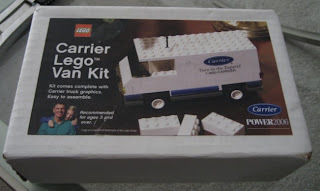 BrickBuildr: Carrier LEGO Van Kit? WTF? Anyone know where this one came from? If so, please e-mail me. There's a copy of one on eBay for sale. A follow up: found this... it came from a Carrier convention back in January, created by brick artist Nathan Sawaya... I should have known... I remembered seeing this on-line, but didn't put the two ideas together, due to the lack of recognition of the "Carrier" brand... Oh, well. The set is still cool & all, but don't think it's worth $25+ I'll have to wait and see how much it goes for.